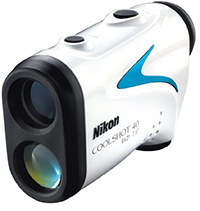 Golf rangefinders are a must-have for any guy that wants to take their game to the next level. These compact devices give you the ability to determine distances between fixed points on the course. This extra knowledge can give you the upper hand to make the most out of your shot. You can gauge your distance from the hole, choose the best club for the job, and improve your overall pacing. With that being said, choosing the right rangefinder can be a bit daunting. 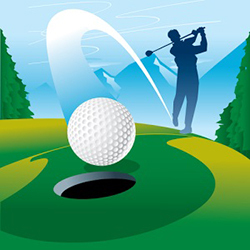 There are a number of great options available to golfers. They vary in features, usability, and price points. With so many manufacturers and models, it’s not difficult to find a superb rangefinder that can give you the information you need without breaking the bank. To help you on your search for the right rangefinder that’s within your budget, we’ve categorized the best options on the market into three different price ranges. Whether you’re looking for a full-featured option around 300 dollars or something a bit more affordably priced under 100, this list has you covered. 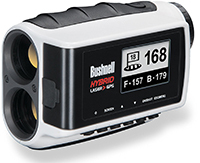 * Within each price range is the best rangefinders you can get for your money. 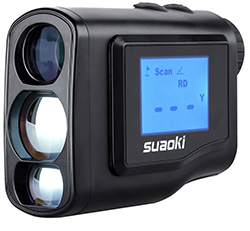 This light and rainproof rangefinder from Suaoki is a great option for golfers that need accurate measurements without hurting their wallet. It can provide precise measurements within one meter. Data is displayed on the crisp LCD screen. To help you see your target easily, the rangefinder has 6x magnification and a focus wheel. There’s also a number of useful modes, including Flagpole Lock, Golf Distance Correction, Fog, and more. If you’re in a pinch, you can easily operate the rangefinder with one hand. It’s weighs only six ounces and both the “Mode” and “Power” buttons are located on the top within finger’s reach. This affordable option from Tonar is versatile enough for use on and off the golf course. It can provide measurements on the LCD display in either meters or yards based on personal preference. The farthest distance it can measure is 600 meters. It’s also accurate enough to provide you with distances measurements within one yard. The rangefinder is lightweight, weighing under seven ounces. An included carrying strap and pouch make it easy to use on the course. The gadget’s added protection from water and shock ensure that it’s durable enough to provide you with years of use. With a mode for continuous scanning, you can get fast and accurate readings with this rangefinder. It measures up to 540 yards away with one yard accuracy. Three different scanning modes allow you to get the right readings for any situation. A pinsensor can measure targets in wooded areas with ease. Information is displayed inside the multilayered optics lens. This technology makes it possible to see your target clearly without any issues, even with vision problems. The body of the rangefinder is light, ergonomic, and water resistant for added safety. It comes with a pouch, strap, and cleaning cloth. From the renowned optics company is this high-quality rangefinder filled with useful features. The powerful device measures up to 650 yards away and can provide accurate data with accuracy of just two and a half feet. It also provides distances in half-yard increments. You can clearly see information in the optics lens. One great feature is the Hyper Read mode. This mode provides quick measurements in just half a second. There’s also a continuous mode that measures distances to multiple targets within an 8-second window. To make sure that trees in distance don’t affect your data, the First Target Priority mode measures only the flag. This Bushnell rangefinder combines the best of both worlds by including a built-in GPS. The GPS function supports over 30,000 courses around the world. Best of all, there’s no membership fees to use its features. Information is displayed on an LCD screen on the side of the device. It can provide you with distanced from the front, center, and back of the green. There’s also useful auto recognition features to let you focus on the game. The rangefinder portion is very powerful, allowing you to measure targets up to 1,000 yards away with one yard accuracy. This aggressive rangefinder has a laser that can reach 1,300 yards. Measurements are taken with precision down to half a yard. The optical lens inside allows you to get a close-up view of your target with 6x magnification. Information is shown on the dual display. You can change the color of the data to red or black to get a crisp view based on the lighting conditions outside. The device is packed with useful features like JOLT technology to provide you with a tactile indication of when you’ve locked onto your target. There’s also slope compensation, which can be turned off to make the rangefinder legal. With a cool and ergonomic design, you won’t have trouble carrying this rangefinder on the course. Like other Bushnell products, you can expect great accuracy and measuring distances. It can reach 1,000 yards with 1 yard accuracy. The lens has 5x magnification and a unique focus system. The system makes the image clear fairly quickly, allowing you to get measurements at a moment’s notice. Distances are changed to accommodate hills and inclines. To ensure that you can use the rangefinder during tournaments, the feature can be turned off. This gadget also has the JOLT system to deliver vibrations as you lock onto the target. There’s a common misconception that golf rangefinders are complicated devices that are difficult to use. However, rangefinders are relatively easy to use after a bit of practice. They can take some time to get used to, especially when it comes to different modes. With practice and a few tips, figuring out distances with the device will become second nature. It should go without saying that you need to read the instruction of your new device. If you’re one of those guys that thinks they can figure it out right off the bat, you’ll soon find that you need a bit of guidance. Since different manufacturers use their own unique system and mechanics, it’s good to understand how the gadget works. Figure out what each button does, what the viewfinder symbols mean, and what different modes are available. Once you understand how the device works, try it out on something between 50 and 100 yards away. Choose something you’re familiar with and measure it from a distance you already know. Doing this will help you gauge the rangefinder’s accuracy and give you a better idea of how to operate it. Going straight to finding long distances to a flag can be both confusing and overwhelming. A large tree in your backyard or your house from the end of the driveway is a great start. Simply point the rangefinder in the direction of your target and let the gadget do the rest of the work. It should register your target, mark it, and provide you with the data you’re looking for. Compare it to the data you already know to get a better understanding of how it works. Even if you haven’t started using the rangefinder regularly during your game, take it out on the course anyways. You can gain some valuable experience on the course before the data you receive has any real effect on your game. Once you’ve gotten the hang of targeting larger targets, try to target an actual flag on the course. Use it when you’re in the middle of the course closer to the hole. Start fairly close to the pin and target it repeatedly until you get comfortable. Make sure that you’re getting a consistent reading each time. 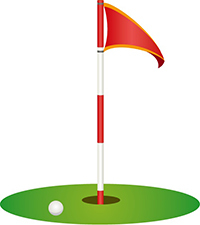 Alternatively, you can target flags on shorter holes that provide you with an approximate distance. You can use this information to compare and contrast data you measured on the rangefinder. Instead of targeting the actual pin, aim at the flag. Pins are thin and flexible poles that can be difficult to aim at. Because you need to stay relatively still as you mark the target, the pin isn’t a great target. On the other hand, flags are large targets that you can often see from a distance. Flags are placed to make pins visible to the naked eye, so why not use it for your rangefinder? You’ll have a larger target that’s easier to hold still for as you gather data. Depending on the quality of your rangefinder, it will probably come with a few different modes to increase the device’s versatility and make measuring distances much simpler. These modes are often explained in detail in the manual and can be initiated with the push of a button. Some of the most common modes include Pinseeker, PinHunter, and First Target Priority Mode. Essentially, these modes measure the distance to your target without letting surrounding objects affect the data. It basically distinguishes the flag from the trees and objects behind it, allowing you to get an accurate reading. On most devices, initiating the mode makes a reticle pop up. 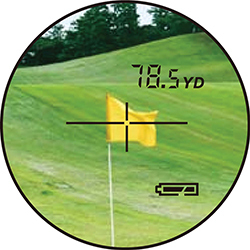 The rangefinder has to be pointed towards the ground during initiation to prevent an accidental reading. Once the reticle has appeared, simply aim it at the flag and press the button to get a reading. Once you’ve started using the rangefinder on the course regularly, it doesn’t hurt to test the device every once in a while. It’s good to compare readings to known distances. If you’re near a marker, why not measure the distance to the flag to make sure that you’re still getting accurate readings? 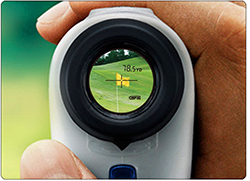 On the course, golfers can choose from one of two devices to measure distances: a laser rangefinder or a golf GPS. These two gadgets have revolutionized the world of golf in the last decade since they’ve been introduced. Both are relatively easy to operate, widely available, and much better than guessing or pacing. Most golfers have their own personal preference, but how do the two compare? There’s a huge difference in price between two devices, especially in recent years. In the past, GPS gadgets were pricey. In fact, many courses offered them as an expensive extra amenity. Today, they’re much cheaper and very versatile. Golf GPS is available as a standalone device, an application on your smartphone, or even on a smart watch. They range in price based on the device, but many application versions are available for free. Laser rangefinders are generally more expensive. They utilize advanced technology that’s not as readily available as GPS satellite. As a result, you’ll be paying more. However, prices for modern rangefinders vary as well, allowing you to get an option that fits any budget. Since the advent of the smartphone and smart watch, GPS options are filled with additional features that you may find useful. In addition to measuring distances with a simple press of the screen, you can see a full map of the course, track scores, monitor your fitness activity, and much more. Some options even come with voice prompts that let you know where you’re at without even looking at it. Rangefinders are specifically designed to measure distances, so they’re not as full-featured as GPS devices. However, they do provide you with a lot of great features you need. In addition to typical measurements, they can provide you with slope parameters. Unlike GPS devices, rangefinders can also be used on any course. You don’t have to worry about constant charging and it can serve you faithfully for years to come. GPS devices may not have every course available. Even if they do have it, they require constant updating to stay useful. 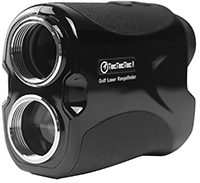 If you want the best accuracy possible, laser rangefinders are your best option. They utilize laser waves to hit the target. Measurements are taken from the reflected rays that come back. Mathematics play a heavy role in finding an accurate measurement. Luckily, everything is done automatically and precisely. High-quality rangefinders can measure distances down to a couple feet. GPS options use satellites to map the course. They use your location in real time to provide appropriate distances. While they’re relatively accurate, they’re nowhere near as close as a laser rangefinder. Typically, GPS systems can be off by a couple of yards. This is due to satellite position, updates to the course, and inaccurate maps. When it comes to ease of use, GPS systems are typically easier to operate. All you have to do is find the map and let it do its job. Depending on the quality of the device, it can follow you from hole to hole and provide distances when you need them. 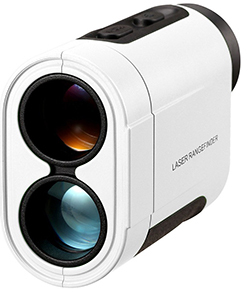 Laser rangefinders require you to get the measurement yourself. You must aim the device at your target and push a button. Mastering the technique isn’t the easiest, but it can be a quick process once you have it down. Advances in laser technology have made it a bit easier on newer models. They can get reading much faster and various modes allow you to take slope and surroundings into account. While many golfers think that knowing general distances are good enough to play a game of golf, getting precise measurements can make all the difference. 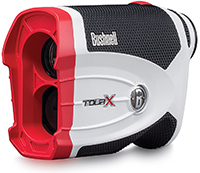 With a great rangefinder, you can take quick measurements that allow you to make good calls on the course. Regardless of which option you go with, a golf rangefinder can put you ahead of the game and help you dominate the competition.